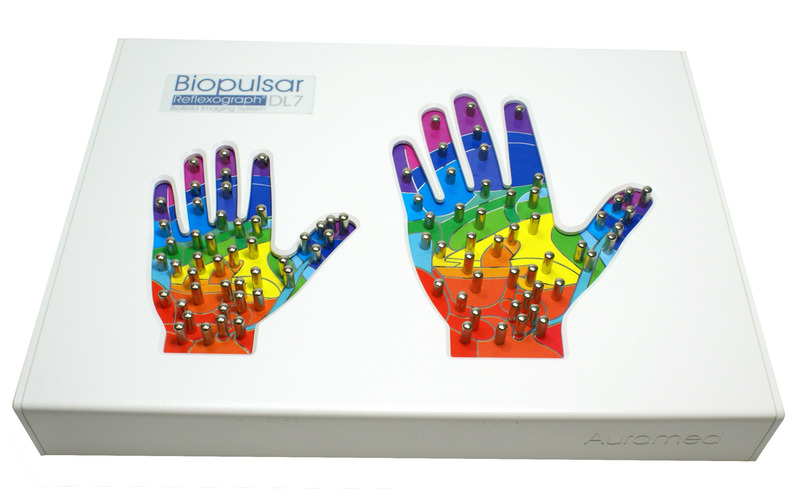 The Biopulsar-Reflexograph biofeedback systems are -concerning hardware (biofeedback sensors) and software – built up in modules and can be arranged according to your individual requirements. 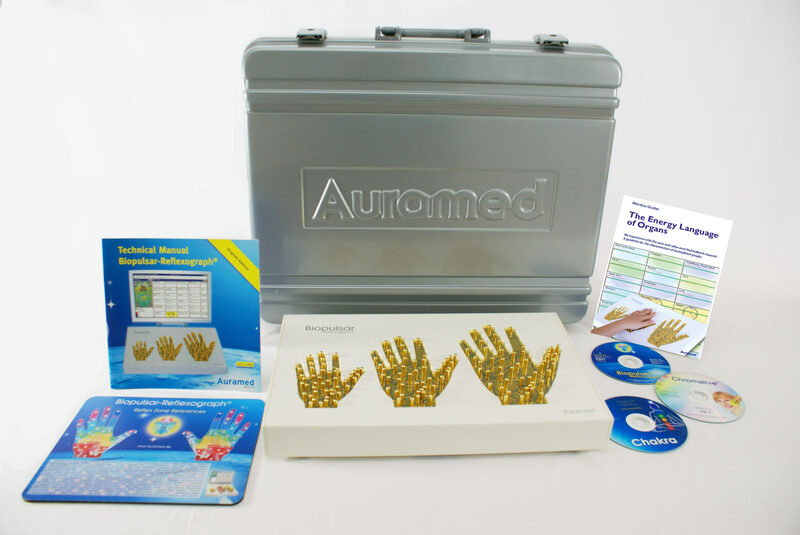 All biofeedback sensors are delivered in an attractive Auramed suitcase with a fitting foam inlay, the corresponding software package (CDs), an electrode gel, a technical manual, a booklet for the interpretation of the measuring data and a mousepad with detailed description of the measured reflex zones. A PC / notebook with the operating system Windows™ XP, 7 / 8 or 10, a printer as well as at least one Analysis Software Module are obligatory. A digital camera is optional. The sensor consists of 3 different sized templates for the reflex zone measuring of the left hand (palm of a child, of a woman, of a man). On the Biopulsar-Reflexograph® 2-Hand Biofeedback sensors there are 2 different sized templates for reflex zone measuring of the left hand shaped like a palm. 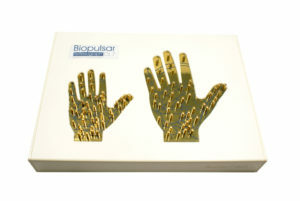 On the Biopulsar-Reflexograph® 2-Hand Biofeedback sensor there are 2 different sized templates for reflex zone measuring of the left hand shaped like a palm. 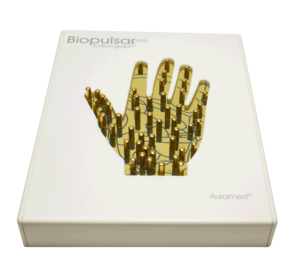 On the Biopulsar-Reflexograph® 2-Hand Biofeedback sensors there are 2 different sized templates for reflex zone measuring of the right hand shaped like a palm. On the Biopulsar-Reflexograph® 1-Hand Biofeedback sensor there is one template for reflex zone measuring of the right hand shaped like a palm. 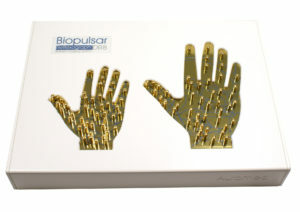 What do you need in order to work with a Biopulsar sensor? 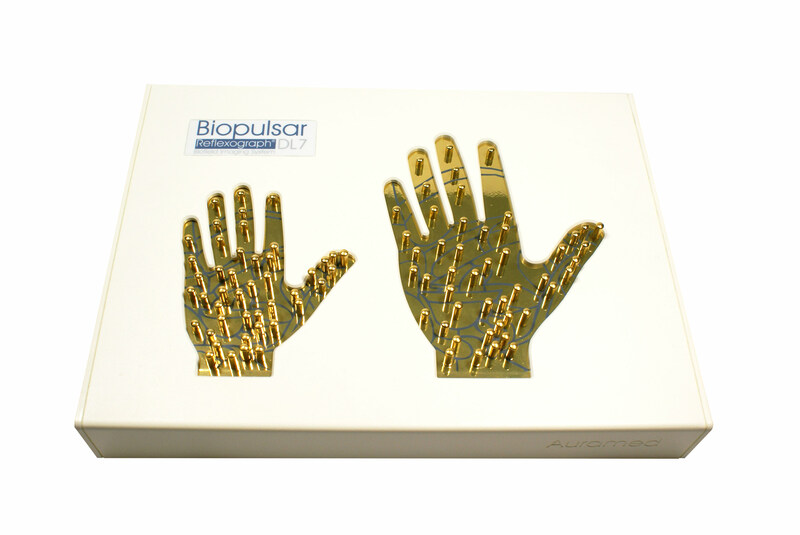 The Biopulsar sensor can only be operated with a PC/Notebook with a Windows™ operating system and at least one Analysis Software. What are the advantages of this measuring method? Each biomedical sensor is an interface, making electrodermal measurings every 500 milliseconds (ms) on 43 reflex zones and transferring them to the PC. This time factor corresponds to the synaptical real time. 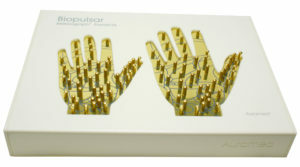 The biomedical measuring electrodes are situated on the reflex zones of the hand and are adopted to its anatomy. 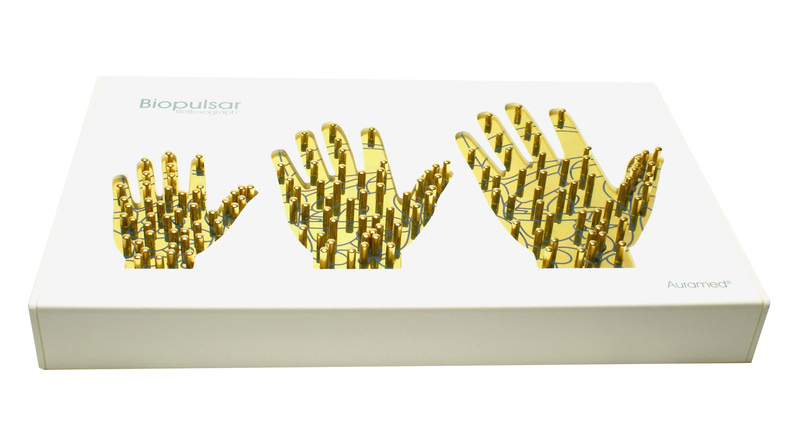 The premium 24-carat gold plating offers an excellent optical appearance and provides an optimal energy circuit. 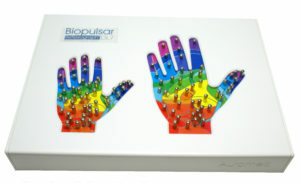 The Biopulsar-Reflexograph® Sensors need neither line current nor battery. The energy supply is made only by the PC or notebook. 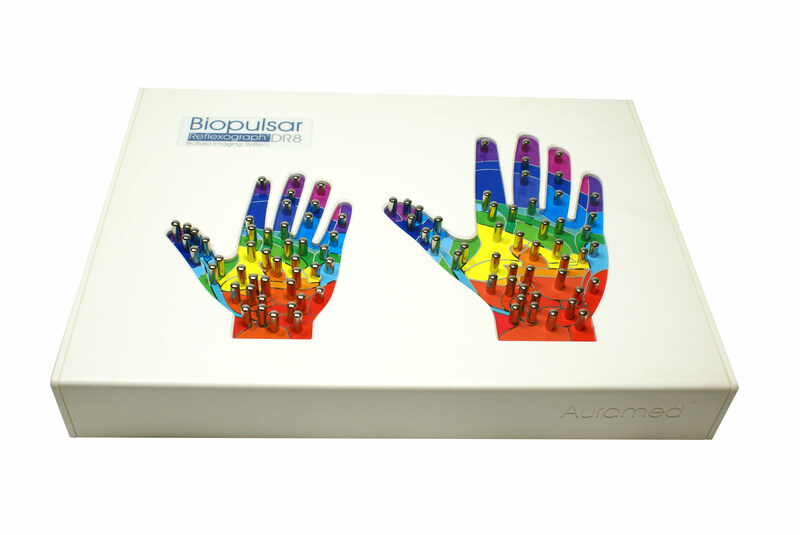 The hand-over-hand measuring method ensures that the counsellor/therapist does not have to touch the client and therefore does not influence the measuring results. By laying one hand above the other the measured hand cannot shift and an even pressure is ensured.